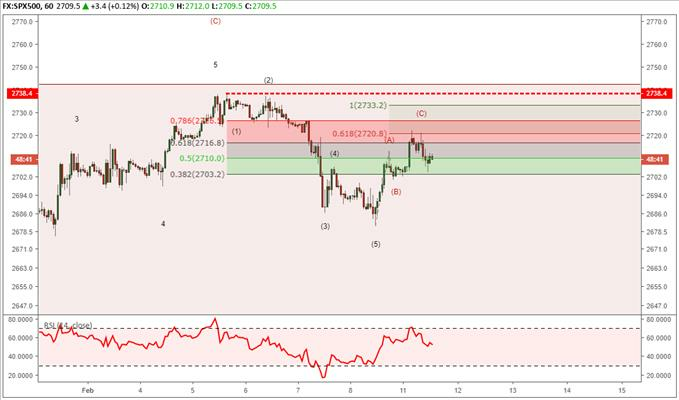 (MENAFN - DailyFX) The SP 500 rally has pressed limits to an immediate extended third wave correction though short term evidence of bearish impulse builds. EURUSD has failed to confirm the December 14 DXY price extreme. The video above is a recording of a US Opening Bell webinar from February 11, 2019. We focused on the Elliott Wave patterns for key markets such as SP 500, NASDAQ , DJIA , DXY, EURUSD, USDJPY , NZDUSD , USDCAD , Gold , Silver , and Oil . S & P 500 Rally is interrupted by bearish impulse We have been on alert for the potential for a stiff fall in S & P 500 since October. S & P 500 did tease a correction of such a nature in December. The recent rally has pressed the bounds so the Elliott wave picture has options. However, the structure from last week's high in SP 500 does sport a bearish 5-3 pattern ( bearish impulse wave followed by corrective zigzag pattern ). As a result of this recent structure, a cautiously bearish bias below last week's high. On the flip side, a move above the December 3 high near 2815 places more weight on medium term bullish outcomes. The minimum bullish waves have been counted for Nasdaq 100 Much like the S & P 500 above, Nasdaq 100 has finished the minimum waves under the bullish Elliott wave zigzag pattern to consider it complete. If so, evidence should begin to build through impulsive waves to the downside. Nasdaq 100 is currently testing a support trend line. The inability to hold here and a break down below 6,600 indicates a larger and deeper correction may be at hand. EURUSD and DXY price action diverge A subtle clue has developed for the past two months that hints at weakness for US Dollar. On December 14, 2018, US Dollar Index barely touched a new high while EURUSD failed to touch a new low. On the chart below, we inverted EURUSD to make it more obvious this divergence. This type of movement typically occurs near an important change in trend. For the past 4 to 5 months, US Dollar has been gaining strength so the inability of EURUSD to confirm hints we may see US Dollar weakness on the horizon. USDJPY extends itself from the January low After the Japanese Yen flash crash on January 2, we wrote how that outsized price action may have put a period at the end of a three year Elliott wave triangle pattern . If so, then USDJPY may be in the beginning stages of a multi-year rally. Recently, we can count advances taking place in motive wave while dips are in corrective waves. This near term bullish price action supports the longer term forecast for USDJPY .